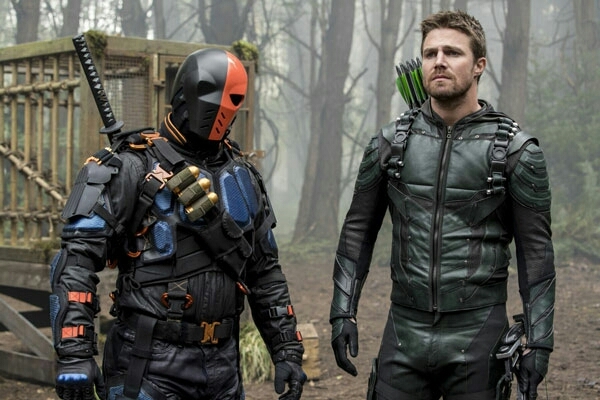 Deathstroke recently returned to Arrow along with the man underneath the mask, Slade Wilson. 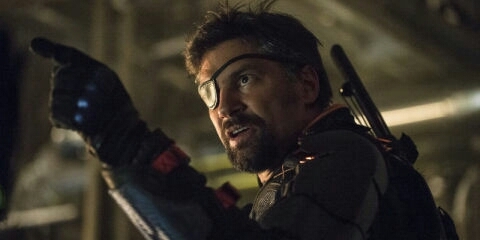 Which I feel the need to clarify because earlier this season we had Deathstroke showing up in Arrow's big crossover episode, however, it was clearly not Manu Bennett under the mask. It was also a weird alien mirage thing. Anyway, I'm not here to write about what he has done- but rather what he should do next! Deathstroke is very cool but Manu Bennett has been the man to really bring him to life in the TV series. He has a gruff attitude that tells you that he truly means business, even with very few words.I wouldn't mess with him. Arrow has had its ups and downs over the years but for me (and many other fans,) the height of the show was season 2's climax. This was the big Oliver Queen and Deathstroke clash. It was epic, it was action-packed, the stakes were high and the drama was intense! Top quality television. Which is exactly why we need more of the character in the CW Berlantiverse. If you've seen Arrow's season 5 finale then you'll know that we are being lead to believe that he, along with everyone Oliver cares about, has been blown up on Lian Yu. However, if you have half a brain then you'll know that they must have escaped somehow, but it's figuring out HOW that's the tricky bit. Even if he is only in the next season briefly, CW should consider giving him a spin-off series. Perhaps Slade wants to find his son on his own? And along the way he uses his mercenary abilities to make money. Give him some cool missions along the way and you've got an awesome Deathstroke TV series. There are many, many comics to choose from! Failing that, I would be cool with an animated series, like with Vixen! 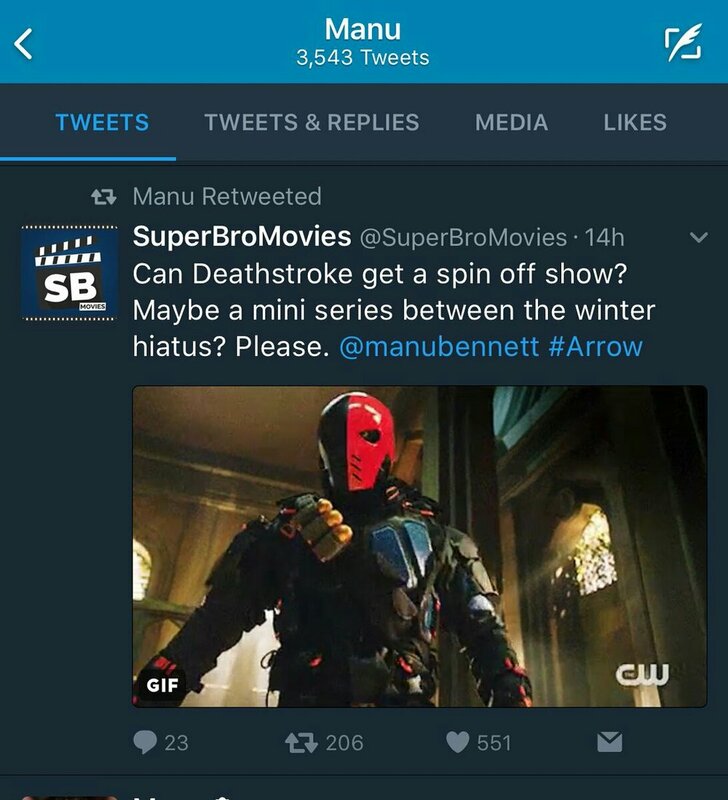 I would prefer live action Deathstroke but I know Manu Bennett is a big part of another show, The Shannara Chronicles and so shooting schedules may not work out. 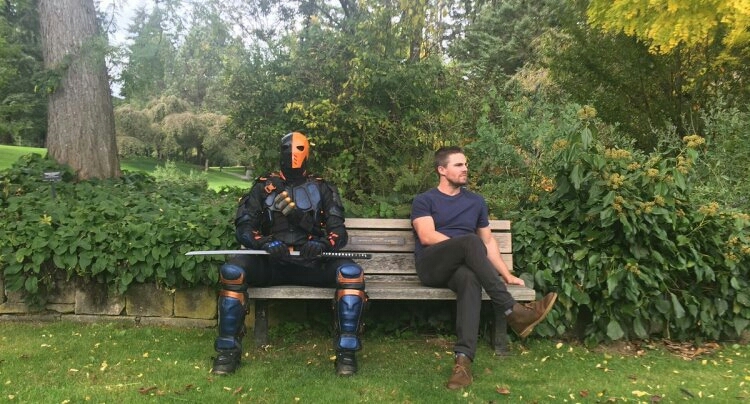 I'm pretty sure that a lot of the Deathstroke scenes in Arrow's finale were done by a stand in. Then Bennett did his voice-over. You can tell because he would wear the mask unnecessarily, unless he was around Oliver and Nyssa. Those actors must have been available at the same time. It also became pretty clear when Deathstroke had to step away from the rest of the cast, into a different shot before taking off his mask. Anyway, my point is that he seems to have a bit of experience with voice acting. Therefore, get him back to the studio! Also, you can do a lot of cool stuff in animation. There's no need to worry about the budget and so we can have epic action and huge explosions! Nothing could hold him back then! We've had animated Deathstroke before (in the current DC animated movie franchise) but not as a main character and not within this continuity! In very recent comics, Deathstroke has even been connected to the Speed force! This occured in The Lazarus Contract, a cross-over event between Deathstroke, Titans and Teen Titans. We could have the character on The Flash and adapt that story! Deathstroke could be the villain in series 5! (Because we all know Devoe AKA The Thinker will be the villain next season) If Slade wants to be as powerful as possible then it makes sense that he might travel to Central city to confront their speedsters? Also, he and Kid Flash have comic book history considering their affiliations with the Teen Titans. Adapt some of that stuff and call it a day! It would be fascinating to see him go up against some super people. Especially if he puts up a good fight! Which he does all the time in the comics (He's even taken on Superman!). This is exactly the sort of thing that I want! Make it happen CW!